2: If you would like to "read all about it", please just scroll down! "All shoe shops are not the same. For us, accurate fitting & quality brands are just the start - our customers also get...."
We are passionate about supplying Jersey's feet with correctly fitted, healthy shoes - especially the children; you may already have heard about us, or you may already know us personally - either directly or indirectly. After accurately measuring the feet, we will only offer you shoes which suit the shape and size of your feet, and will tell you if your child does not need new shoes just yet. What we are best known for is our fantastic Kids' Club - a FREE club which guarantees regular savings on top brands of children's shoes. Examples of the offers can be found HERE. 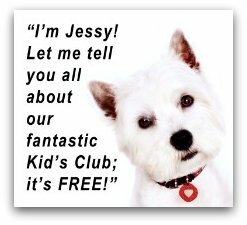 These are changed regularly, but are only available to members; look for Jessy the dog below for details! When were your child's feet last measured or had shoes bought? Did the person who measured them seem competent and knowledgeable? Did he/ she explain the characteristics of your child's feet? Were you offered a choice of shoes in a suitable style and fit? It takes years of measuring and fitting thousands of little feet to get the experience we have - and that is what you get when you visit. We also know our range of shoes inside out; we did after all select them ourselves from reputable manufacturers to provide excellent fitting and superb value for money. You just don't get that from shoe ranges chosen by, and sent down from, a UK "head office" - think about it. If you are still not sure, watch our video which can be accessed below. If you are still not sure, come in and see us. We will accurately check, measure, and advise in an honest and professional manner - with no charge or obligation.